Our goal is to introduce our young players to the exciting game of football. The program serves to instruct children in grades 2 through 8 on all aspects of the game, with a focus on teaching good sportsmanship and teamwork. Our program is designed to introduce children to the basics of football and to create an exciting environment that allows children to learn, be successful, but most of all, play at a level that is safe for them. 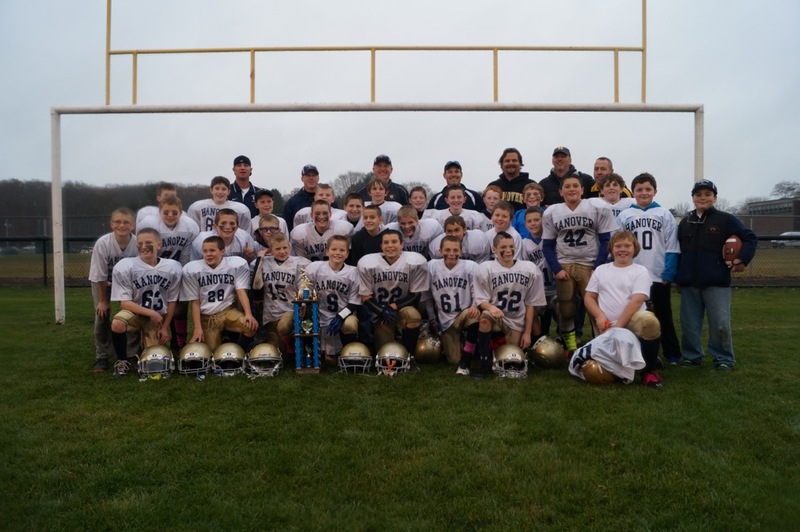 Over the last ten years, the HYAA Youth Football program has been extremely successful. To continue to provide a quality, successful program focusing on the fundamentals and sportsmanship that is HYAA Football, we will again be combining the third and fourth graders into one Mite team, fifth and sixth graders into one Peewee team and seventh and eighth graders into one Midget team. There are many benefits to this structure. The larger teams will allow kids to come off the field to rest and hydrate between plays so they are less prone to injuries. Players at all levels will still see plenty of game time with an eight game varsity schedule and a seven game JV schedule. This will allow the coaches not to have to overextend the kids by having them play two full games every weekend. We will also have more coaches to a team which will mean a lower coach to player ratio, and enable more player’s individual instruction time. This structure will maximize the opportunity for each of our players to develop their skills, experience game situations and to do so in an environment that is safe, comfortable, and the most conducive to learning. The football program consists of three different Divisons: Midget, Pee Wee, and Mite. The Divisions are organized around both age and weight requirements (see requirement levels). Age - No Midget player shall attain the age of fifteen (15) prior to November 15th of the current year. Weight - At the official, scheduled weigh-in, the maximum weight will not exceed 165 pounds. Age - No Pee Wee player shall attain the age of twelve (12) prior to July 1st . Weight - At the official, scheduled weigh-in, the maximum weight will not exceed 130 pounds. Weight - At the official, scheduled weigh-in, the maximum weight will not exceed 105 pounds. At the Official OCYFL Weigh In held early in September, players will be given a 10 pound allowance over the weight limit in their Division. Each week the weight limit goes up a pound. So for example, the Midget weight is 165 pounds. If a player that weighs 170 pounds, he or she can be rostered, but unless they loose weight, they will not be allowed to play until week 5. Registration will remain open through May 20th for $140.00. Beginning May 21st a $35.00 late fee will be added to all registrations. Go to On-Line Registration. HYAA provides: Certified helmets, shoulder pads and Hanover Game Shirts. Equipment will be distributed from the Football Shed at Sylvester field in late July/early August. A refundable, $100 deposit is required at time of equipment pickup. Additional Equipment required but not supplied by HYAA includes: Colored mouthpieces (clear mouthpieces are not allowed - Referees need to be able to see the mouthpiece through the facemask.) Game pants with pads sewn in, Practice Jerseys, Practice Pants with pads sewn in and Cleats. Players are required to have PLASTIC MOLDED cleats, no screw in cleats are allowed for safey reasons. Kickoff to the 2018 Season will start with a joint HYAA and Hanover High School Football Camp at the High School. The Camp will be run by the Hanover High School Coaches and players and the HYAA Youth Football Coaches. Registration for Camp shall be on-line by visiting the HYAA Website, Football, 2018 Camp. The 2018 Schedule is published in early August and you can view/download at the Old Colony Youth Football League website at www.ocyfl.com. Games will be held on Wednesday evenings throughout the summer from June 13th - August 8th. Games will be played from 5:00-7:00 pm. All games will be played at Forge Pond Park. Registration fee includes official NFL Flag Football jerseys, belts and flags, USA Football player membership and 9 games throughout the summer season.